A research paper by Miguel León-Ledesma (Professor of Economics) together with Dr Cristiano Cantore (Bank of England) and Dr Filippo Ferroni (Federal Reserve Bank of Chicago) has been featured in VoxEU and Bank Underground (the research blog of the Bank of England). ‘How do monetary policy shocks affect the distribution of income between workers and owners of capital? Do workers benefit relatively more when policy changes? Using evidence from five developed economies, we show that the share of output allocated to wages (the ‘labour share’) temporarily increases following a positive shock to the interest rate. This means that the slice of the pie enjoyed by those whose earnings are mostly made up of wages increases at the expense of profits and capital income. Strikingly, this redistribution channel that shows up in the data runs precisely in the opposite direction to the predictions of standard New Keynesian models commonly used to study the effects of monetary policy. This entry was posted in General, Research on March 27, 2019 by tjg. Dr Anirban Mitra, Lecturer in Economics, has recently been awarded a British Academy Small Research Grant for his work on political dynasties and vote-buying. Anirban, together with his collaborator in India, Dr Arnab Mukherji (Indian Institute of Management Bangalore), will explore the connections between the issues of political dynasties and vote-buying with the aim of building a database for politicians in the State Legislatures of India to identify their family networks. Political dynasties exist in many countries – be they democratic or otherwise. Another issue which is salient worldwide is the practice of vote-buying in elections. This entails the use of campaign funds to ‘persuade’ voters – ahead of any impending elections – to cast their votes in a certain way. This is conceptually different from winning over voters through explication of the superiority of one’s policy platforms. It is a form of bribery, and is clearly against the very notion of fairness in democratic procedures. We propose to study the connections between the two issues namely, political dynasties and vote-buying. Specifically, we ask the following questions: to what extent is vote-buying linked to the existence political dynasties? Does the institution of political dynasties lead to a greater surge in vote-buying activities or not? Can this putative link shed light on the mechanisms shaping the organisation of political parties? We propose to start building a database for politicians in the State Legislatures of India which would identify their family networks. Clearly, doing it for all the major states in India would require vast amounts of resources (including time) though undoubtedly such a database would be of considerable value to social scientists working on India. We propose to start work on three populous states in India – namely, Bihar, Karnataka and Uttar Pradesh. This would allow us to work with a sample of 870 electoral constituencies followed over a decade; hence, allowing for around 2 elections in each constituency. We plan to utilise this database to assess the implications for public goods provision (specifically, investments in health and education among other items) arising from the presence of political dynasties. We also hope to delve into the question as to how informal institutional features (like family structure, gender norms, etc.) may be crucial in determining how political dynasties arise in some societies and not others. This work will be critically dependent upon our understanding of the network of family ties that pervade the Indian political system. This entry was posted in General, Research on March 18, 2019 by tjg. 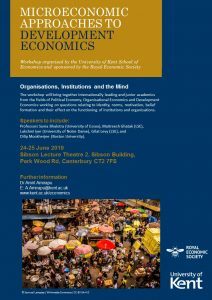 The School of Economics is hosting a workshop, sponsored by the Royal Economic Society, on Microeconomic Approaches to Development Economics: Organisations, Institutions and the Mind. 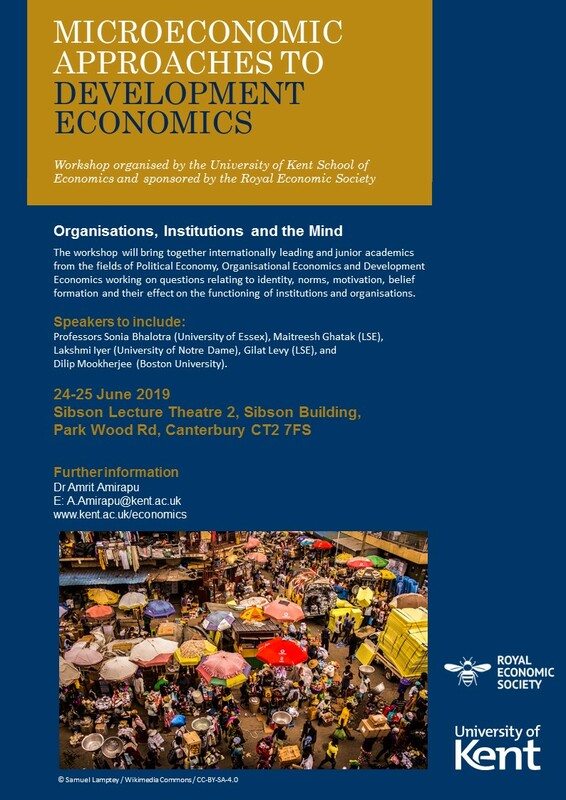 The workshop will take place on 24-25 June 2019 at the University of Kent, and will bring together internationally leading and junior academics from the fields of Political Economy, Organisational Economics and Development Economics working on questions relating to identity, norms, motivation, belief formation and their effect on the functioning of institutions and organisations. Confirmed speakers include Professors Sonia Bhalotra (University of Essex), Maitreesh Ghatak (LSE), Lakshmi Iyer (University of Notre Dame), Gilat Levy (LSE), and Dilip Mookherjee (Boston University). Research presented at the workshop will include work that touches upon issues of direct policy relevance today, such as the effective functioning of political institutions in developed and developing countries, motivating workers in the public sector, changing cultural practices that entrench social inequality or economic inefficiency. A call for papers for the workshop is now open. Submissions from early career researchers are especially welcome. Funding for accommodation (up to two nights) and travel (from within Europe) will be provided for one participant per accepted paper. The closing date for submissions is March 15, 2019. Papers should be sent to Amrit Amirapu at A.Amirapu@kent.ac.uk. This entry was posted in Research on March 11, 2019 by tjg. Join us to complete either the NSS or the UGS in a computer room this week. We’re providing a FREE drink and chocolate!! All eligible students who complete the NSS will be entered into a prize draw for an iPad* and four £50 vouchers! If you’re eligible to participate in this year’s survey, you will have received an email invitation from Ipsos MORI on Thursday 31 January. To enter the School of Economics prize draw, complete the survey and forward your NSS survey completion confirmation email to economics@kent.ac.uk. If you’ve already completed the survey, email your confirmation to economics@kent.ac.uk to enter the prize draw, or come along and join us for a drink! The University is also running the Undergraduate Survey (UGS) – the UGS is an internally run survey of all students on Undergraduate level programmes at the University of Kent (excluding those who are eligible to complete the NSS). This entry was posted in General on March 4, 2019 by tjg.